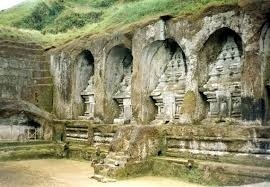 TOUR: GUNUNG KAWI TEMPlE AND MOUNT BATUR. 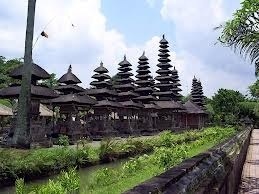 I pick you up from your residence at the time you want.First we go to the favorite Gunung Kawi Temple, this complex temple was built in 11th century when Bali under ruled of Anak Wungsu the son of Udayana King. Gunung Kawi consist of 10 memorials temple rock cut, the rock cut has 2 groups, one group has 4 temples in western side belived monuments Anak Wungsu's chief concubines and 5 groups in eastern side belived monuments for the King of Udanyana, his wife, Airlanga, Marakata and Anak Wungsu. One monument built a litle bit far in south of the other complex, this monument belived for the priest of the king. 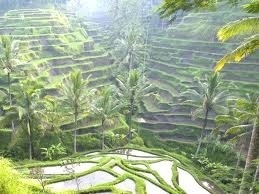 There are about 200 steps go down to see this monument with nice view of rice terraces. Than we drive to the rice terraces at Tegallalang Village, this rice terraces has beautifull view with coconut trees and beautifull small river valley. Tegallalang Village well known with the village of handicrafts centre specially for wholesale and export, a long of the road you will see a lot of the shops, they sell variety of painted woodcarving with colorfull designed. The painted woodcarving products the sell made from very light wood with reasonable price, they do sell theirs handicrafts for retail too. 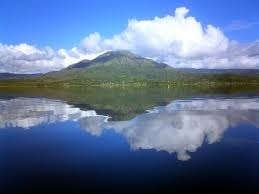 After that we drive to Batur Mount Volcano, this places located in Kintamani District - Bangli Regency. 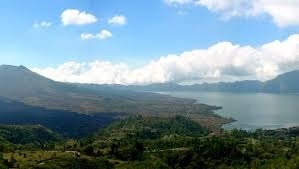 Penelokan Village will be the best to view of the Batur Mount and Batur Lake. Batur Mount has eruption several time already, the biggest eruption was 1926 destroyed the Batur Village, this village it was near the lake and now they move to the top. The black lava was the eruption in 1974. This is still active Volcano smoking all the time. There are many restaurant built surround the crater specially for lunch time. 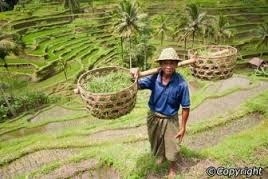 This tour the most famous trip for tourist who visit the island. After this beautifull view we drive To Pengelipuran Village, this is traditional village located in Kubu district - Bangli Regency, it's about 4 kilometers north of Bangli town. This village help to maintened by Bangli Government. 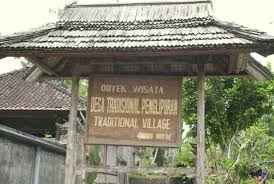 The unique things with this village is the main gate of the house built in same style and the roof made from Bamboo. 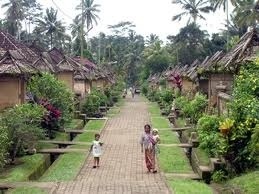 For visitor who visit this village will allow to enter the family compund inside, the people can see the kitchen and family temple, in the back yard they grow coffee, bamboo plantation. We end this daytrip at Kehen Temple, this temple located about 10 minutes drive from traditional Pengelipuran Village or 10 minutes drive to the north from Bangli town. 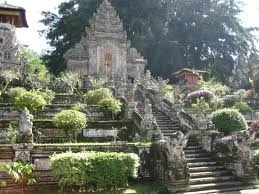 The temple built in the hill side of Bangli Hill, this temple is state temple of Bangli Kingdom. The first courtyard has big Banyan tree with wood bell Kulkul and in top yard built 11 step of Meru, this is dedicated to the supreme Gods (Ida Sanghyang Widhi Wasa), the base of the Meru is Turtle and 2 dragons (Anantaboga and Besukian dragon). The temple belived the second biggest temple in Bali. After this i bring you back to your residence. As always there is enough time to stop, see and make pictures.